In 2011, Zurich-based architect Fawad Kazi submitted the winning proposal for the rebuilding and extension of a hospital complex in the Swiss city of St Gallen. Over a period of ten years, a number of existing structures will undergo vast rebuilding and new ones added, transforming a park with individual buildings into a single continuous complex. This new, eventually five-part monograph documents this project in full detail. It highlights its significance for St Gallen’s urban design as well as the specific demands to architectural design and construction and to the hospital’s operations. Volume I features the project’s genesis and the initial new building, a pavilion structure housing a restaurant and, in the basement, an electrical substation. 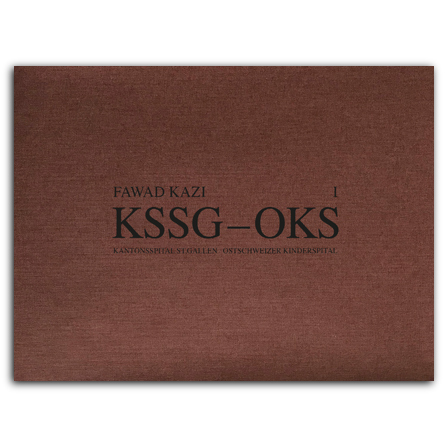 With contributions by Werner Binotto, Clementine Hegner-van Rooden, Rolf Steinegger, and Marko Sauer; a conversation with Fawad Kazi by Marko Sauer and Christoph Wieser; and with photographs by Georg Aerni. (born 1959, Winterthur), Photographer and artist. Diploma in Architecture ETH Zurich in 1986. Numerous solo and group exhibitions, fellowships and awards. In 2011 his book Sites & Signs was published by Scheidegger & Spiess publishers. , born 1971 in London, is an architect and runs his own studio in Zürich since 2001. He graduated from ETH Zürich an Columbia University, New York. took his degree in architecture from ETH Zurich and a has done his PhD at the Ecole Polytéchnique Fédérale de Lausanne (EPFL). He works as an architectural critic and researcher and also lectures a various Swiss universities of applied sciences.